To be sure, there’s much to be said for the iPhone’s multitouch interface, which allows Apple to deliver many of the comforts of desktop computing to a mobile device. But it still falls short when it comes to looking at charts, spreadsheets, and tables. After all, you can pinch to zoom and flick to scroll all you want, but it’s still hard to see which cell belongs to which column and row once you’ve zoomed in close enough to make data legible. “It’s like trying to read a spreadsheet through a straw,” says Santiago Becerra, chairman of mobile app maker MeLLmo, of the shrink-to-fit approach mobile platforms use to get tables on to tiny device screens. Becerra thinks his company has a better approach, one that lets users view data in a way that’s more fitting for mobile devices. On Tuesday, MeLLmo will announce RoamBi, an app that lets users transform the static data from spreadsheets and tables into interactive charts that can be published on an iPhone or iPod touch. The free RoamBi Visualizer app is available for download from the App Store. The RoamBi iPhone app stores data on the mobile device, giving users access to important stats and figures wherever they are. At launch, RoamBi can accept data from Microsoft Excel and—for users with a Salesforce.com account—Salesforce.com reports. Users of the enterprise-targeted version of RoamBi can also import SAP Crystal Reports and SAP BusinessObjects Web Intelligence data into the program. How would you rather look at sales data on the iPhone? Through this dense spreadsheet..
...or through this interactive view that lets you drill down through different hierarchical levels? MeLLmo is betting you’ll pick the latter with its RoamBi app, which can transform that spreadsheet into a CataList view like this. Take RoamBi’s CataList view, pictured right, which was built from a spreadsheet showing sales data by region. RoamBi organizes the data into different hierarchical levels, interpreting those levels based on the metadata from the spreadsheet. The main view shows an overall summary of sales by region with trend indicators depicting how sales have fluctuated. 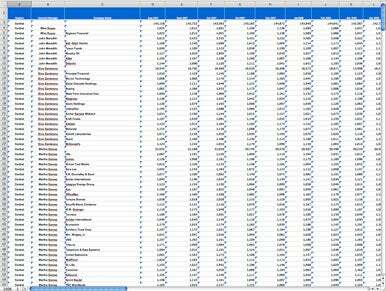 You can drill down from there to see sales organized by account managers, with the next level showing each managers’ accounts; from there, you can drill down to each individual account. The CataList view also features summary cards for individual entries, showing all the information related to that entry. 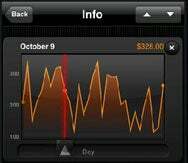 Numerical information appears in charts designed for an iPhone-sized screen, but tapping on a plus-button opens a viewtron window with a slider for a closer look at the data. CataList is one of the four views available in RoamBi at launch. The app also features Cardex, a 3-D filing cabinet-style view of records; Pie View, which presents a spinable pie chart; and SuperList, which displays data in a tabular format, but with fixed column and row titles. MeLLmo plans to have 12 views available by the end of the year for RoamBi. The viewtron window in the CataList view offers a closer look at charts. RoamBi is available as a free software-as-a-service offering via the iPhone app and the RoamBi Publisher Web tool. MeLLmo plans to add a premium offering later this year that will deliver additional functionality. MeLLmo also offers RoamBi Enterprise, a server-solution that lets companies publish key business data to mobile devices. The Enterprise version features a $10,000 license for the on-site server, with a $100-per-user fee for a minimum of 50-plus users; there’s also an annual fee with RoamBi Enterprise.